It was not long before the curtains parted and the emcees, former Council President Ashlynna Ng as well as Lawrence Ora, welcomed the crowd with cheery dispositions and puns aplenty. Mr. Kenneth Kwok, a former Deputy Principal of the school who had a stint working for the National Arts Council, was then invited to kick off the event by sharing several anecdotes about his colourful history with the local arts scene. In a surprising revelation, he recounted how he had performed with Emma Yong – who later became a member of the locally-renowned musical cabaret group, the Dim Sum Dollies – during his time in RI. 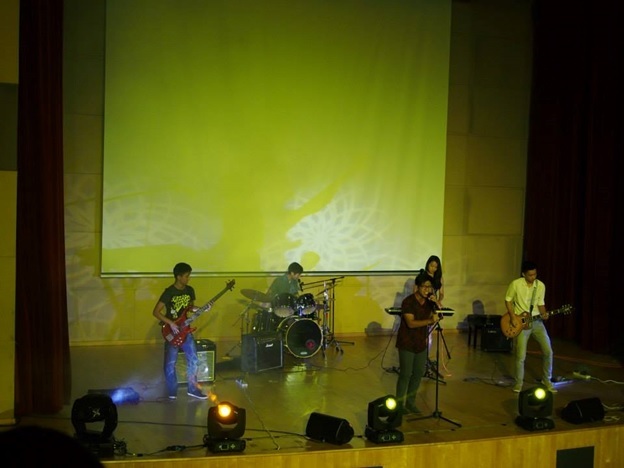 Without further ado, alumni band Branranaway (comprising Chris Loke on vocals, Wenwei Chionh and Alex Yeo on guitars, Gordon Kang on drums and Stephanie Yeap on the keyboard/guitar/vocals) started the concert on a high note with ‘Jenny Was A Friend Of Mine’, a song penned by the ubiquitous rock band, The Killers, and ‘Arabella’ by the Arctic Monkeys. The guitar riffs against a backdrop of thundering drums, coupled with the impressive vocal chops displayed by Chris, galvanised the crowd into spontaneous clapping to the rhythm of the music, with the songs ending in roaring applause. Sustaining their momentum with Paramore’s iconic ‘Crushcrushcrush’, Stephanie took over Chris as the lead vocalist. Despite struggling slightly with the first few notes of the song, she soon got her act together and her rendition of the Paramore song had the audience tapping their feet to the rhythmic repetitions of the lyrics. With their next song, ‘My Body’, by Young The Giant, the band managed to keep the audience’s anticipation running high as Chris took over once again, ending the song with a single high pitched note that showed off his range. Upon hearing calls for an encore, the band’s set ended with one of their trademark set list songs: ‘All These Things That I’ve Done’, another widely acclaimed hit from The Killers. With the conclusion of their enthralling set, it was clear to the audience that the subsequent performers would have much to live up to. The next person to take the stage was a face familiar to all. Edward Kim was aptly introduced by Lawrence as the “Student Council president with good grades, hot body, and pretty girlfriend”. That night, he added another talent, beatboxing, to his repertoire. Edward led off with a short but nonetheless rousing number in which he evinced his aptitude at recreating the sounds of a drum kit. This was merely a prelude for a much more intriguing performance featuring the usage of looping (done via an iPad application), a technique that enables one to layer multiple soundtracks on top of one another to create a musical piece. Despite technical problems being rampant through his performance, with plenty of mike-adjusting and speaker-screeching, Edward managed to pull off commendable renditions – complete with instrumental sound effects and soothing harmonies – of the OneRepublic song ‘Apologize’ and the rhythm and blues classic ‘Stand By Me’ by Ben E. King, both of which were met with resounding applause and catcalls. To the crowd’s surprise, the next performance was not by a student, but by Mr. Koh Say Yong, a teacher in the PE and CCA Department who has been playing the guitar since his secondary school years. Trading his usual track shoes and sports shirts for an acoustic guitar, he launched into the heartwarmingly romantic covers of the Beatles’ White Album classic, ‘Blackbird’, and Cyndi Lauper’s popular love ballad, ‘Time After Time’. The melodious, elegant tunes produced by his instrument as well as his distinctive country twang and sensitive, soulful voice gave the LT a rustic atmosphere and also served as a well-timed contrast to the previous two electronics-heavy performances. Liu Fangzhou, a Writer’s Guild member, then made the mood in the auditorium more serious with her recitals of two rather sombre and thought-provoking literary works: a self-composed poem titled 21122012 and an untitled prose piece by Catherine Hu. Notably, the former piece had clinched a merit award in the prestigious Foyle Young Poets competition. The lyrical, expressive compositions were definitely engrossing to listen to and well worth reflecting upon. Those who missed the performance may find the poems in the anthology ‘Love, Death and Some Things In Between’, which can be purchased from Writers’ Guild at $6 along with a free copy of ‘Compositions’, a collaboration between Writers’ Guild and the Raffles Photographic Society. Next, Lim Wei Khai took the stage and proceeded to regale the crowd with a self composed poem about a monstrous boogeyman-esque creature. He was promptly followed by Aaheli Tarafdar, who told a similarly grisly narrative about a family’s deadly outing to the zoo. Both narrated their stories in ironically exaggerated, jocular tones of voice, and the tales were also chock-full of black humour, making for a decidedly mirthful and enjoyable listening experience. The boisterous peals of laughter the storytellers managed to elicit from the audience faded away as Feng Yu Chen and Clevereno Dairini from Raffles Chordslingers played the introductory notes to a mashup of ‘Counting Stars’ by OneRepublic, ‘Timber’ by Pitbull ft. Ke$ha and ‘Wrecking Ball’ by Miley Cyrus on two majestic grand pianos, lulling the audience into tranquility. 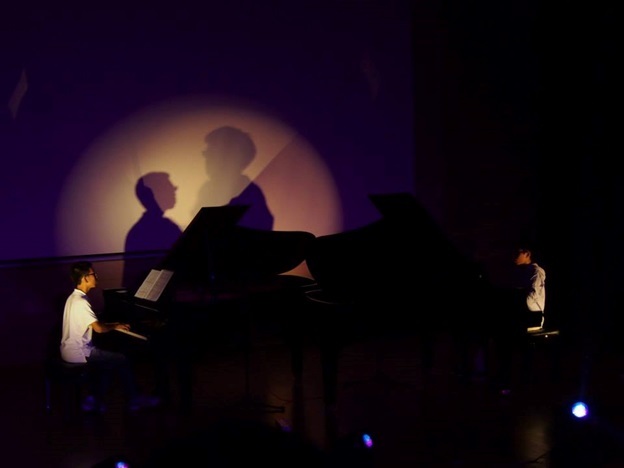 Raffles Chordslingers is a self-initiated piano interest group not unlike RI’s Chamber Ensemble, and comprises Year 2-3 RI boys who arrange their own music and perform their own covers. A well coordinated duet between two pianists is no mean feat, and Yu Chen and Clevereno, with their relatively smooth rendition of the band’s hit single, successfully managed to surmount the considerable challenges inherent in executing such a performance. 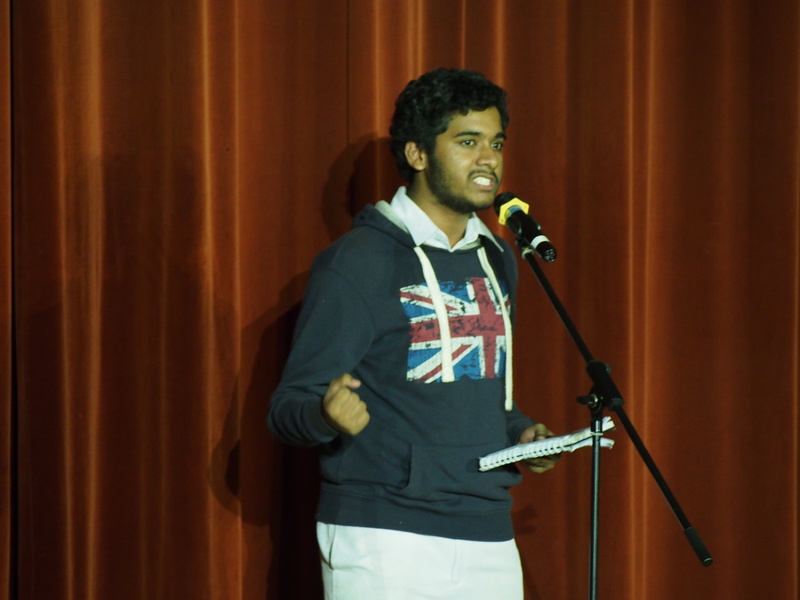 Legendary amongst actors and non-actors alike within RI, J3 alumnus Shrey Bhargava’s stand-up comedy routine was, without doubt, a much-anticipated performance for many of the attendees. As it turned out, ‘boring’ is the last word one would use to describe the talented thespian’s act. 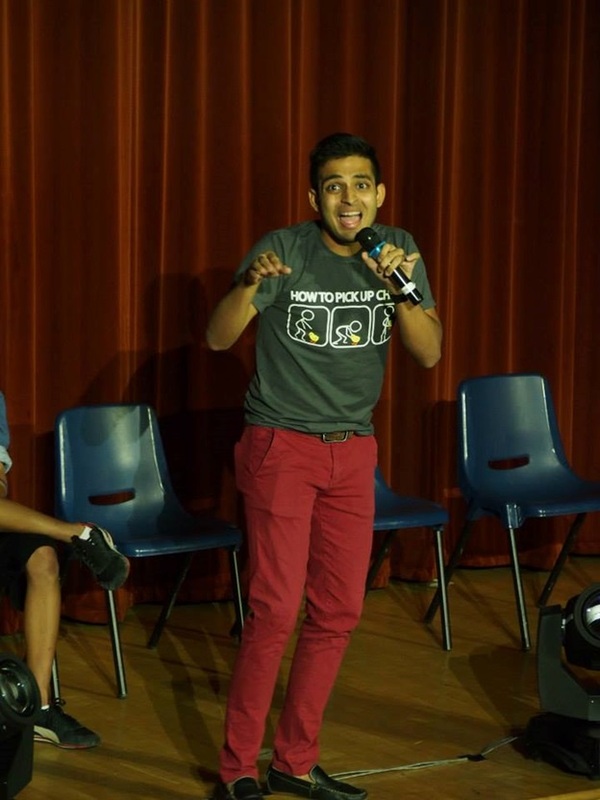 Shrey’s stage presence and overwhelming confidence had the audience in guffaws and applause throughout his performance, despite it being only his second attempt at stand-up comedy. His performance included imitating various witty versions of accents and national stereotypes from around the globe, and he touched on features such as the ‘small mouth’ effect of Russians and the ‘politely violent’ undertone of Japanese accents. His interpretation of Indian accents was met with especially uproarious laughter, and so were the hilariously unsuccessful attempts of the three volunteers he had invited onto the stage to learn from his ‘tutelage’. The emcees then informed the audience that the next performance was about ‘Slam Poetry’; this was a strange-sounding concept many of us viewers were unfamiliar with. All queries were quelled when Wahid Al Mamun, Naresh Manoj and Gabriel Ng each carried out a trenchant, captivating recital of their self-penned poems, which bravely grappled with difficult topics such as alcoholism, depression and the nature of love. The quality of their poetry was indeed commendable and symbolism was rife within their works. The three aspiring poets are, as Naresh revealed, part of a community called Burn After Reading Poetry (BARPo) – a spoken word poetry interest group. Naresh related how he had found poetry “way too inaccessible” until he had spent an eye-opening time with the branch of BARPo located in England while on his Gap Semester trip. Upon his return, he and a few other like-minded peers came together to form a Singaporean offshoot of the programme. “We plan on an anthology soon and recently had our first performance at Artistry Cafe, which was exciting,” he shared. Clearly, Naresh’s participation in such extracurricular activities, like that of so many other Rafflesians, is indicative of his unalloyed passion for his chosen field. 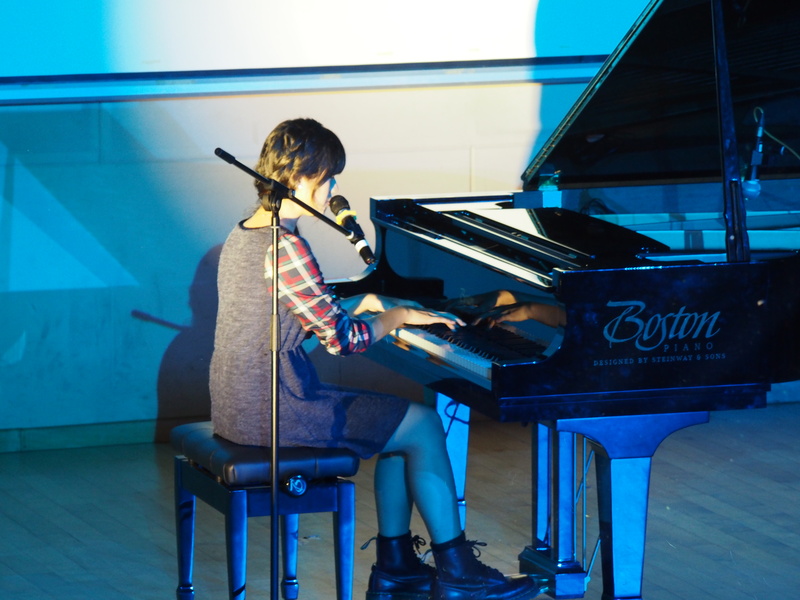 Next was Yeo Min, one of the top-eight finishers in the 2013 Campus Superstar competition and a multi-instrumentalist who can handle the cello, guitar and piano. She first started her two-song performance with the song ‘魔鬼中的天使 (Angel Devil)’ by Hebe Tien; the intermingling of her voice and the soft chords of the piano created a near-perfect rendition of the Mandopop hit. Displaying the musical virtuosity and flexibility that had carried her so far into the competition, Yeo Min followed this performance with a stellar rendition of the classic and heartrending love song, ‘Love Me’ by Collin Raye, which told a story about a couple’s journey in love through the years. The song featured poignant vocals and melancholic piano playing that tugged on the heartstrings of many amongst the crowd, the authors not excluded. Though it flourished nearly a century ago, in the Roaring Twenties, the audience’s spirited response to the Raffles Jazz team’s set made it patently evident that jazz music remains relevant to many in the present day. Their first song, Canadian singer Nikki Yanofsky’s ‘Bienvenue Dans Ma Vie (Welcome to My Life)’, was defined by powerful, evocative vocals from Faith Ng and first-rate musical accompaniment. Stefanus Phan then took the microphone for a lilting, rousing performance of ‘Pedestal’ by Charlie Lim, during which the audience became so enlivened that they started clapping of their own volition. The finale, a purely instrumental piece named ‘Strasbourg/St. Denis’ by Roy Hargrove, marked a consummate showing of the Jazz team’s proficiency at their genre of choice. Bassist Zhu Wei Jie, who had little experience with performing prior to RIJC, remarked that in her time in Jazz this year she had learnt to “enjoy the time standing on stage and make music as a conversation with audience, instead of getting stressed.” With that, CultuR Shock! concluded amidst fervent applause from the audience. Overall, we found CultuR Shock! to have been a greatly entertaining and unforgettable experience. Though their sets were only 15 minutes long at the most, it was clear that all the performers had passionately invested considerable amounts of effort into preparing for their brief appearances under the spotlight. More importantly, though, CultuR Shock! was an arts buffet that showcased the sheer diversity of Rafflesian talents, while opening our eyes, ears and minds to a diverse variety of individuals and art forms that, owing to a lack of awareness, we had never really appreciated before. Credit must also be given to the organisers, who had planned the order of the performers such that different genres of performances were evenly spaced out throughout the concert – the musical performances alternated with the literary ones – and this meant that we never felt overloaded by a single type of performance and paid rapt attention throughout. Brandonranaway is not from Rock (: Only Gordon and Steph are/were from Rock! The rest are not! Edited, thank you for pointing it out!